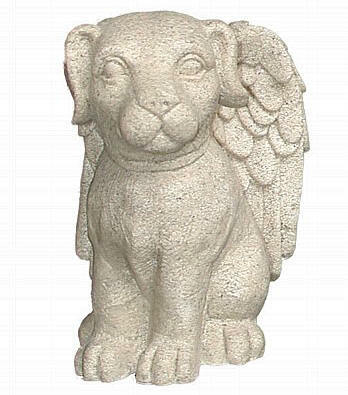 Our beautiful angel statues line includes animal angels such this sitting puppy dog angel figurine. Shown in a beautiful stone marble like finish which is hard to miss. The dog angel's wings are outstretched and beautifully detailed. Made of resin and stone mix. Normally ships in 1-2 weeks. Labradors are known to love being with people. In fact, they do not like to be left alone. Loneliness is not something they deal with happily and so Labradors will experience separation anxiety if they are left too long on their own. It is also said that the dog will create chaos and trouble if left on their own too long. So many of us look to our garden as a way of escaping – a place where we can rest and discover ourselves. Many of us like to gather in our garden to take refuge and spend time away from civilization. And so, it is a place of refuge, a place where one spends time to relax and enjoy without feeling the drag on the fast paced life that sometimes overwhelms us with modern living. Our catalog highlights beautiful suggestions that create movement and function. They can add a considerable amount of energy and drama to your landscape, giving breadth and depth to a space. Harbored amidst all that greenery and floral beds, these choices we offer also add to a focal point supplementing character that we can happily relate to. They can add humor, romance or even tell a story. Invest in accents and lawn décor like finials and bird baths to convey movement or stillness or add an element of surprise. Use these as a contrast to the landscape and highlight a particular area in marked detail by introducing surprise and at times, whimsical fun. You can email us for more information on our line of sculptures and statuary.